​ AUSTIN – Central Texas new-home construction surged to an 11-year high in third quarter 2017. 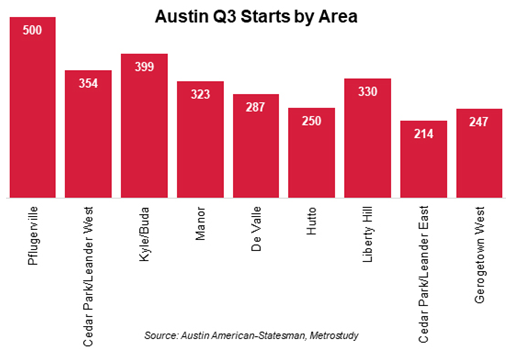 Austin area builders started work on 4,586 houses in 3Q 2017, up 12.5 percent from the same quarter the previous year, according to Metrostudy. The nearly 4,600 starts marked the highest level since 3Q 2006, when a record 5,041 starts were recorded. On an annual basis, home starts in the metro also reached their highest level since late 2006, as builders started construction on 16,719 houses in the 12 months that ended in September 2017. ​Chec​k out more housing stories across Texas. Also check Connect for more on this story​.